Posted on May 18, 2015 at 4:31 am. Thrills Casino has gotten its very own exclusive Net Entertainment online video slot, and it has the potential to offer some big wins. 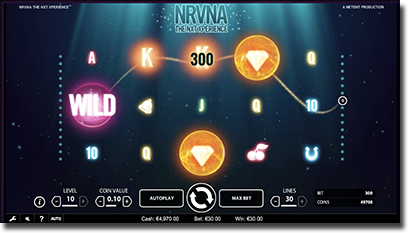 Titled NRVNA, the online pokie is a collaboration between the casino and leading software developer Net Entertainment. NRVNA is only available at Thrills Internet casino, proving that while the Web casino may be young when compared to the more established Internet casinos, it’s striving to offer unique experiences from competitors. When an Internet casino and software provider work together to produce an exclusive game, they generally collaborate on the graphics, the audio, the theme, the bonus rounds, and the overall ambience to create a game which you can only find at that specific web casino. This is exactly what the guys at Thrills have done in conjunction with Net Ent, for their new video slot NRVNA with the main aim of the game to create a sense of ‘nirvana’ when spinning the reels. Featuring a 5-reel, 30 payline format, the video slot includes the usual Scatter and Wild symbols, as well as free spins, multipliers and even a special bonus feature. Since nirvana means to create a place of bliss, the audio is quite fitting and the backdrop of what looks like the night sky lit up with stars creates a peaceful ambience. The Wild symbol, which is a star inside a pink circle, sees a 3x multiplier attached when a winning payline is completed, something which isn’t commonly found on many poker machines. The Scatter symbol, which is a diamond inside of an orange circle, sees up to 30 free spins available to win. But the best part about getting the free spins is the bonus feature which can be triggered inside the Free Spins Bonus Round. Known as the NRVNA Wheel of Fortune, players spin the wheel to win more free spins or a multiplier, of up to 10x. The payout percentage of this slot is 96.6% which is standard for NetEnt pokies, and it has a maximum payout of 966,000 coins. Additionally, NRVNA is available to play on your smartphone or tablet, as well as on your laptop or desktop computer in instant mode only.